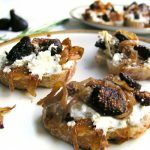 Mission figs, caramelized onions and goat cheese are an incredible flavor trio and even more delicious served warm and spread on to baguette slices or crackers. You do all the cooking ahead of time and then heat and assemble the bruschetta just before serving. 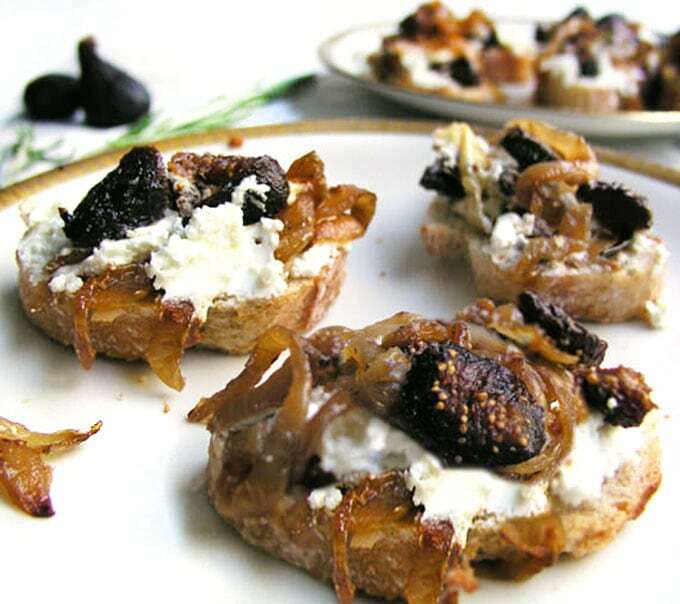 A heap of creamy, salty goat cheese is topped with sweet caramelized onions, garlic and fruity figs, baked and served hot, spread onto bread or crackers. A few days ago, when I was starting to write about this recipe, a friend mentioned on Facebook that this is National Fig Week and I was excited to have a newsworthy peg for sharing one of my favorite party appetizers with you. But as I typed the words, “this is National Fig Week”, I began to wonder how a food holiday gets determined and how official it is. Is there some sort of bureaucracy you have to endure or papers to file or can anyone call anything National Anything Week? “Yes” to the last question. There’s no law preventing anyone from naming their own holiday and many of the National food days we read about are basically clever marketing campaigns. There are some legit special food holidays though, such as National Ice Cream Month – July, and National Ice Cream Day – the third Sunday in July. These were proclaimed by Ronald Reagan and written into public law on July 2, 1984. There is one more “official” source for these types of special days and weeks which is called “Chase’s Calendar“. It is a McGraw Hill publication that has been listing special events and holidays since 1957. Even if something starts out as a marketing campaign, getting it listed with Chase’s Calendar is almost as good as getting a Presidential proclamation. I like the food holidays. It’s a fun way to be reminded of what’s in season and get inspired to cook something new. Here are some of the upcoming food holidays Chase lists for this month: Today is National Vanilla Cupcake Day, November 14th: National Guacamole Day, November 17th: Home made bread day, November 23: National Sardines day. The list goes on. Now let’s bet back to National Fig week and this bruschetta recipe. This recipe is adapted from a Food Network Show called Party Line with The Hearty Boys. It’s one of my favorite party appetizer recipes because it’s quick and easy to prepare, I can make it ahead of time, and it’s always a huge hit. 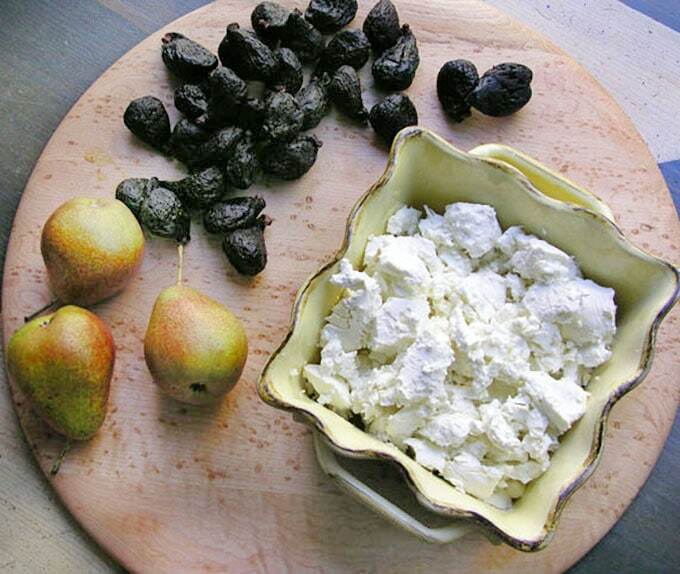 I have one more favorite goat cheese party appetizer you should know about because it only takes ten minutes to prepare, Goat Cheese Dressed For A Party. 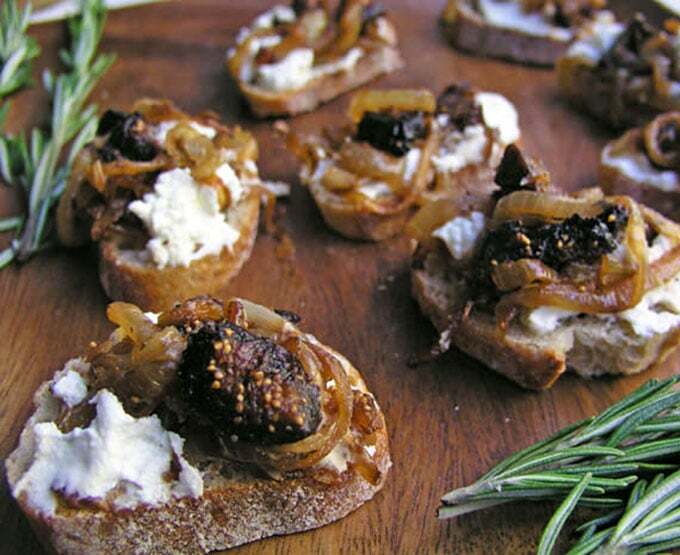 I’m really excited for you to try this Goat Cheese Fig Bruschetta recipe for your next party, and I hope you will come back to leave a comment if you do. I’d love to know what you think. Preheat oven to 350º F. Crumble the goat logs into a medium-sized oven-safe dish (ideally, something that can go from oven to table) Set aside. Put sliced figs in a small saucepan. Add sherry and a little water to cover. Bring to a boil and remove from heat. Set aside. Dried figs will plump and absorb the flavor of the sherry. Meanwhile, heat olive oil in a large skillet over medium heat. Add onions, garlic, rosemary sprigs, salt and pepper. 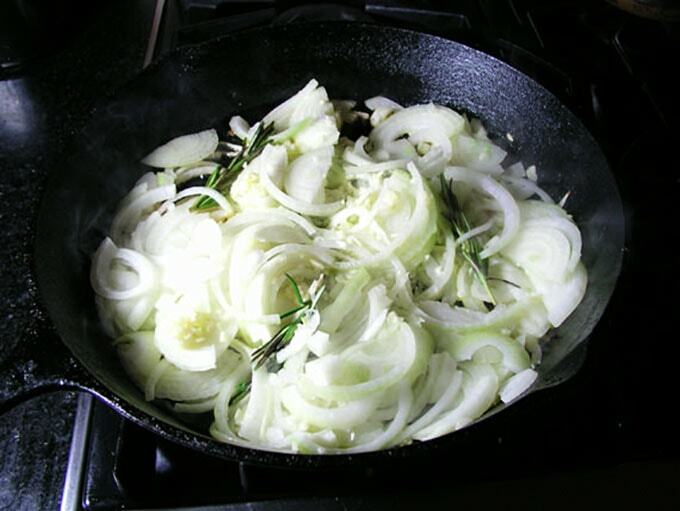 Sauté, stirring often, for 10-12 minutes, until onions are lightly browned. Remove plumped figs from pot using a slotted spoon and add them to the onion mixture. Stir to combine. Discard thick woody rosemary stems from mixture, and heap the caramelized onions and fig mixture on top of the goat cheese. MAKE-AHEAD NOTE: At this point you can cover and refrigerate the dish for a day or two. When you are ready to serve it, let it sit at room temp for 1/2 hour before continuing. Juste before serving, bake in the preheated oven for 20 minutes, until cheese is hot and starting to bubble at the edges. Serve hot, surrounded by baguette slices or crackers. Enjoy! One of my top recipes from panningtheglobe and that’s a very high bar! That sounds absolutely wonderful for me…I love the combo! I am completely addicted to caramelized onions! Can someone tell me a good wine to drink with this? Thanks. One of my very favorite Goldfinger nibbles — easy to make and ridiculously tasty. Great looking blog, Lisa! I can vouch that this is totally delicious!! Yummy! This came in as I was at Trader Joe’s yesterday shopping for Pats game food. I bought the ingredients on the spot and am making it this morning. Can’t wait! this is on my to serve list for Thanksgiving! So beautiful and festive. Time for me to move back to Boston so I can join your dinner parties! Can’t wait to make this. The photos for this post are incredible! I can almost taste the caramelized onions…. Thanks betsy! When are you moving back? I can’t wait! I have tried this and it is outstanding. Simply amazing on a piece of warm bread with a nice glass of red wine. The combination of flavors is sensational. Also enjoying the blog. Will try the GCCO&F Bruschetta. Nice work. Thank you so much for your kinds words about the blog, Andrea. I hope you like the recipe!